I bought this tea because of the tin. I admit it. I’m a sucker for tins. I have amassed quite a collection of them, and still they continue to fascinate me. It took me a while to actually try the tea inside the tin. I didn’t have high hopes for it. I think my apprehension is a combination of my bias when it comes chai (I love my own blend!) as well as my preference of loose leaf. The package calls this a “full leaf” which led me to believe that this would be a loose leaf tea. Alas, it is packaged in sachets. However, unlike conventional tea bags, these sachets are very spacious and offer plenty of room for the expansion of the leaves while they steep. This chai has a pleasant spice level. It isn’t too hot or spicy, but it offers enough warmth to perk up the taste buds as well as chase off the chill! I really love the star anise in this blend – it isn’t an overwhelming presence of star anise, but it delivers a faint yet very pleasant licorice-y note that tickles the fancy of this licorice lover! The pepper and ginger seem to work very together very harmoniously in this blend to deliver just the right punch of peppery taste right at the finish, while the cinnamon, cardamom and cloves deliver an agreeable base of delicious spice notes. 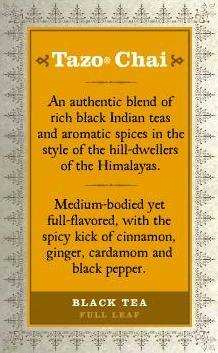 The black tea is strong but it is willing to stand aside and let the spices deliver most of the flavor here. It just sits back, in the background, and delivers a steady stream of black tea flavor that is unassuming yet delicious. I actually think I prefer this chai as a non-latte (that is without steamed, frothed milk), because the milk does tend to mute the effect of the spices just a little and I do like the way the spices taste in this blend. A little dollop of honey is all I need to enjoy this warm, tasty blend. And as much as I enjoyed the tea, I can’t help but feel a little disappointment in TAZO. I wish that TAZO had a stronger devotion to the environment. It’s a company based in Portland (which is local for me, and a city that prides itself on being GREEN). I would feel so much better about buying these products if the sachets were made of biodegradable material (rather than nylon) – or better yet, forgo the sachets completely and go loose leaf. Offer refill packages for the tins so that we can reuse them. OK… I shall end my rant and step down from my teabox!